The Dar es Salaam Stock exchange has extended its trading time by an hour. It usually operated from 10am to 3pm but will now run from 10am to 4pm starting 11 February. The move was necessitated by the need for more time by bond dealers. Additionally, the extension will favor foreign investors who operate on a different time zone. What happened in NSSF sounds like big miss-management of data migration. Control systems were not established prior to migration. This should not ever happen, especially with pension money. If they messed up with data migration, how can they be sure in their ability to make adequate corrections? NMG closes at 71. It's taken a while longer than the rest of its peers in the NSE 20, but it's slowly coming around to lift-off. Safaricom appears to be developing an expanded flat ABC where wave A completed at about Kes 21.77. Now I expect the developing wave B to rise to about Kes 36.49 - 38.70. 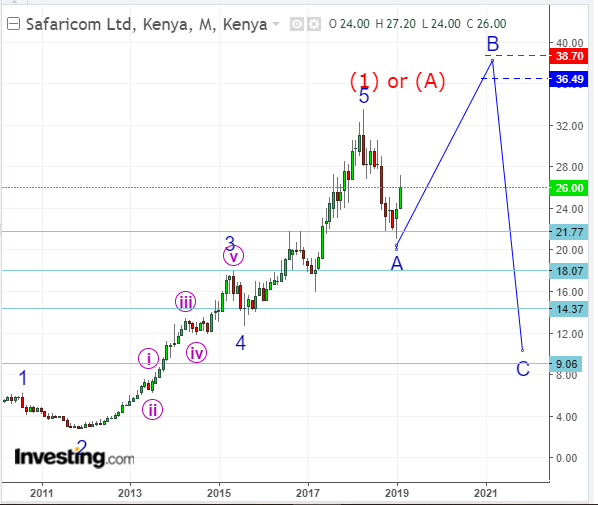 After completion of wave B I will expect Safcom to fall in wave C to significantly below Kes 21.77 (the wave A low). The above scenario is negated if Safcom continues down to below Kes 21.77 immediately. I did warn about bank and insurance companies collapsing when the bear in the NSE 20 Share Index took a strong hold. Then I was being told how Kenyan banks have strong capital ratios, ati sijui we have a smart CBK governor? Now I hear there is a bank and an insurance company that are facing difficult times ? I doubt you were told all banks were the same. Even back then, NBK had poor fundamentals. Overall the KE banking sector looks OK. There will always be a few stragglers. Spire, NBK, etc were weak back in 2016 and remain so today. Even among insurance firms, you have the likes of Jubilee, which may face challenges in some years, and some shady/weak ones that remain on the edge forever. Chief VVS. Where have you cast your net following KK payout? Or where are you looking at. I have to admit the amount of quality stocks has diminished compared to a few years ago, but I always believe there are some gems to be found. As we head into 2Q 2019, what next? I am out of KK. Cash ni ndani but it needs to be deployed starting Monday. I am willing to hold/wait for 5 years for a pay-off. Banks look good. Should I add more to what I have? Manufacturing is suffering but is it a chance to get in? *There are other firms that might be interesting but given the politics and Kenya's debt situation, I want to be cautious. Firms need to handle their debt carefully. Don't expand too fast using debt. @xtina - Thanks for helping me out. Appreciated. @AGuy - I have not narrowed down on my choices BUT they are covered in the list above. I am going to keep some "dry gunpowder" as well. By the time the KK cash came in, some bargains disappeared eg banks. I have decided to stick with a max of 5 "Tier 1" for 70-80% of my portfolio. LONG-TERM. Unga, KenyaRe and I&M remain Core. Unga and KenyaRe remain at lows so I added some. I&M is relatively conservative. Attractive PER and P/B even at 113. CENTUM may make its way to Tier 1 but I am only buying on dips. No rush. Akira has no successes yet. GM may see additional sales with the push for local assembly. YET, I see there may be a decent future if Centum can ride it out over the next few years. I am monitoring firms with high LTVs. Centum has debt but it also has some good investments e.g. Nairobi Bottlers and Almasi. The Management has recognized the debt situation and said they plan to reduce debt (how?) at the parent level and push some debt down onto the project level. Can they sell some mature businesses? Unga has taken on debt for the new Eldoret wheat plant and Soya Meal Plant but I believe it is manageable given the cashflows. TPSEA which has also taken on substantial debt to expand Nairobi Serena. What I have seen so far makes me happy but I want to see the new rooms. It was beginning to look dated but the new/expanded/updated facilities should attract more MICE business. I think Serena needs to expand into Westlands/Diani/Kisumu/Runda even if they just manage (not buy) a property. Also it needs a secondary (3-star) brand that can benefit from Serena's expertise. Equity - The DRC business is doing well but I want to add more at sub-40. NIC and Stanbic - They will be OK in 2019. NIC+CBA. Stanbic finally seems to have a handle on their NPLs. Kapchorua, Williamson - Affected by land issues as we get to 2022. Low tea prices. Labor problems. I am keeping what I have BUT not buying more at the moment. C&G - Imports are problematic with the slow clearing processes and additional costs. Lack of motorcycle plates. Equipment sales are slow with slow payments from GoK. A large vacant property. Provision for bad debts. 1H 2019 doesn't seem promising. One needs a strong stomach. Not selling yet. Longhorn - A Centum subsidiary. I started buying at 4.50 but the price has jumped quite a bit. The 1H was encouraging. It is pricey on a PER and P/B basis. The "P/BV" is not an appropriate measure given it is about IP. Eventually, I think Centum will sell it and I hope to ride the wave. It is NOT cheap at 6.50 so I am not buying at the moment. The reliance on payments from GoK is worrying. With massive tenderpreneurship in the industry, how can Longhorn keep itself relevant with those who order the books? Flame Tree - I wanted to add to my position at the lows (2.30-ish) but the price jumped. I will keep what I have and add as needed. I see a very tough 2019. Construction is subdued. Bad debtors abound. Mozambique has lots of issues. I am a VALUE and LONG-TERM investor so I try to buy when the prices are low but the fundamentals of the firm remain strong. A single bad period for a firm isn't a deterrent but an opportunity. What worries me is the ECONOMY at large and the FISCAL IMPROPRIETIES since those affect even well-run businesses. The economy has slowed as GoK took on loans for White Elephants. The slow-down in payments by the National Government and thuggery by various counties is hurting the country and legit firms. Unga has not been paid for the maize subsidy. Huge amounts. C&G is suffering from lack of motorcycle registration plates since prisons doesn't have sheet metal and paint! Also the interest rate cap has reduced sales of equipment given banks aren't lending as much. Non-payment by GoK to local contractors hurts heavy equipment sales. NPLs are on the rise for I&M, Stanbic and NIC. It will take time to work through them. Flame Tree has suffered defaults and slowing private sector construction. KenyaRe suffers from low private sector business activity. All the above coupled with high T-Bond rates. Why invest in expanding the business when T-Bonds pay much better? KenyaRe has 14bn in GoK paper! I am also open to suggestion with well-researched analysis. I am not interested in weak firms hinged on bailouts. I was burnt on ARM after CDC bailed out on it. That excludes EAPCC, KQ, NBK, HF, etc even though some may do well after the bailouts BUT I want to sleep well. It will be a tough 2019 BUT "Get Greedy when others are Fearful"
@chief VVS. I like most of your picks except Kenre and centum. For Ken re- the GOk thing really puts me off, no price is too low for GOk firms as has been proven time and time again. The only one's spared of the scourge being KCB and safcom. In these however Gok doesn't own majority of the the shares. Your call though. On centum, creative accounting,ideas, exuberant employee compensation were the red flag for me. And on the background of the lack of dividend despite the good performance. (I know Berkshire also doesn't,but different kettle of fish) Maybe I'm just being paranoid but that's what my gut tells me. Your other picks are class. Almost in the mould of KK that we loved so much, but Rubis loved her more. What of BAT? growth despite the difficult environment, good dividend payout. Don't know about management but they seem to be to have a good track record. Welcome to BAT, been buying small lots (expensive stock) over the last 1 year (so far a defensive stock and long term capital preservation & appreciation - no crazy capital gains) at prices below 550 bob. At a point i was lucky and got a chunk at 509 bob. Management of BAT is topnotch and watched from UK, no worries. They are never aggressive in their approach to business, but somehow hacks it year in year out though with small profit dips once in awhile. Nowadays i don't like crazy speculative stocks, you need to sleep sound and well. Otherwise you can wait to scoop Safaricom at anything below 25bob. This fuliza thing, plus data expansions/penetration will bring in some good revenue. Asante sana @ann. This is my view as well. It's one of those stocks, defensive, capital preservation like jubilee.